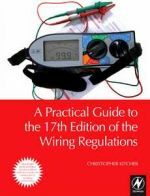 The 17th Edition of The IEE Wiring Regulations is a complex book that has to be read alongside the IEE guidance notes in order to be fully understood. All people using wiring must comply with the regulations and have passed exams in the subject. This book provides an easily understandable working interpretation of the regulations that walks readers through them in step-by-step manner. A step-by-step approach to the regulations makes a difficult subject easy to understand. Mapped to the regulations for easy cross referencing. Packed with illustrations and diagrams to put the subject into context.